SEOUL (Reuters) - Asiana Airlines revised its accounts and said its annual loss widened after auditors raised doubts about the financial statements of South Korea's second-biggest carrier, sending its shares tumbling almost 18 percent on Tuesday. Asiana Airlines said it has got its auditor to sign off on its 2018 financial statements after reflecting provisions related to maintenance of leased aircraft and others, which increased costs. The company revised down its 2018 operating profit to 28.2 billion won ($24.92 million) from 88.7 billion won, while its net loss increased to 196 billion won from 105 billion won. The airline also said its debt was more than six times its equity. Asiana's auditor Samil PwC had previously said it could not complete its audit because it had not been provided with enough information to evaluate the airline's provisional debt related to maintenance of leased aircraft, as well as the fair value of stakes in affiliates bought in 2018. The move prompted two South Korean credit rating agencies to warn they may cut ratings for the airline to junk status. Asiana, part of South Korea's Kumho Asiana Group conglomerate, has sold assets to improve cash flow and reduce debt from aircraft purchases, as it battles rising fuel costs and competition from low-cost carriers. The accounts revision, mounting debt and possible credit ratings downgrades have raised investor concerns over Asiana's liquidity position. 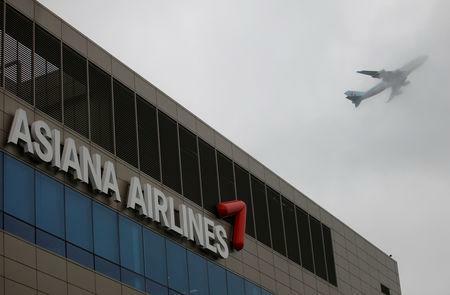 Asiana will have to repay around 1 trillion won in debt this year, said Lee Han-joon, an analyst at KTB Investment and Securities. If its credit rating is cut, the company will face a call to pay back some of its debt earlier, he said. "As doubts grow over the company's capacity to issue asset-backed securities, which has been its last resort to raise funds, Asiana could face a liquidity crisis. Further, it's unclear if it has more assets to sell," Lee said. Nice Investors Service, one of the two credit ratings agencies that warned on Asiana's ratings, said it is not planning to adjust the ratings within this week, while the other, Korea Investors Service, was not immediately available for comment. Shares of Asiana fell to as low as 3,335 won on Tuesday, before closing at 3,435 won, down 15 percent. That was their sharpest one-day fall ever. Asiana's biggest shareholder, Kumho Industrial, slumped as much as 28.3 percent. Trading in Asiana and Kumho resumed on Tuesday after being suspended for two days by the Korea Exchange as auditors had issued qualified opinions on the financial statements of both companies. "We vow to recover trust from investors and financial organisations by adopting strict accounting standards," Asiana said in a statement on Tuesday.